Del Mar Screens proudly offers ClearView Retractable Screen Systems, perfect for your window openings! Gives an unobstructed view when windows are closed. Retractable screens cut window cleaning to almost zero, works well on any type of window. Imagine being able to make your screens invisible whenever you choose! Retractable Screens maintain the beauty of your home without the unsightly look of a dirty screen door. There when you need it, out of sight when you don't. Screening material is available in a gray or charcoal mesh. Specially designed sun screen material is available upon request. The Clear View Retractable Screen System comes with a limited lifetime guarantee on all components except screening material. Color options available for Clear View components are brown, white, tan, bronze, navajo, off-white, and green. 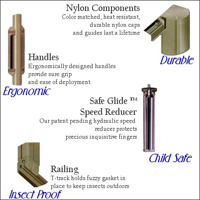 Designed to look good in your home while providing comfort, convenience, and freedom from flies and other insects. Sliding into their housings, they disappear, exposing the view from your windows and doors. Let us install one for you today! Just give us a call at: cell: 760-420-0559. Mobile screen repair. Patio door, sliding door, retractable window screens and pet doors and grills repaired, replaced and installed. Patio door roller and track repair and replacement. Del Mar Screens serving all of the North County area in San Diego, CA. We service all of North County San Diego, which includes the communities of Del Mar, Rancho Santa Fe, Carmel Valley, Vista, Encinitas, Cardiff, Leucadia, Carlsbad, San Marcos, and Oceanside.